Rother’s situation was about to change in many ways. After a week of tests, the infection suddenly subsided; then, in March 1977, Flammende Herzen was released and connected with a larger pool of listeners than any of the guitarist’s efforts before. The album was the first of Rother’s work as a solo artist, and the beginning of the sophisticated, stately set of records collected here. Melodic, romantic and expansive, they channel the pastoral, bucolic feeling of Forst, the tiny German hamlet that Rother moved to in 1973, and where he still lives today. Outside the thick stone walls of Rother’s house, through large windows, lies a grassy lawn, then the swiftly unfolding slide of the river Weser, strangely fast for its width and the size of its floodplain. Behind this glittering, silver stream (which also inspired Brian Eno’s peaceful “By This River”) sit wooded ridges, rising suddenly out of the flat pasture; highland cattle surround the stone and timber-framed buildings of Forst, a picture-postcard of central European rural bliss. Using a four-track recorder he’d bought in 1974, Rother continued the work he’d begun with the title track of Harmonia’s second and final album, Deluxe, tracking out rough, fuzzy demos of brand new ideas. Conny Plank, who had produced nearly all of Neu! and Harmonia’s records, agreed to work with Rother again, and in June 1976 the guitarist headed to Plank’s similarly rural studio, between Bonn and Cologne. Can drummer Jaki Liebezeit was asked to contribute to sessions, while the instrumental palette was kept compact – Rother’s Fender Mustang and Gibson Les Paul, Farfisa Professional Piano, Farfisa Syntorchestra, Liebezeit’s drums and Plank’s Yamaha synth. While restraint was key, then, there was room for improvisation in arrangements. The one ominous-sounding piece on Flammende Herzen, “Feuerland”, was built up in the studio, but it too was inspired by Forst, as well as Rother’s affection for the “high-culture” Donald Duck cartoons created by artist Carl Barks and translator Erika Fuchs. Flammende Herzen, named after a heart-shaped flower, was released in early ’77, with multiple re-pressings following. The album even inspired a film, its every scene based around the ebb and flow of Rother’s music. Harmonia and Neu! had played live, with mixed results, but Rother declined to tour his solo debut, instead burying himself in work on a follow-up. The process was the same, but Rother had more money and time, and recorded some of his new music at Forst using Plank’s mobile equipment. The results were released as Sterntaler in early 1978. This new work sounded more confident – at times harder, as on the opening gallop of “Sonnenrad”, and at others supremely melodic. Rother had also got into the habit of buying unusual musical instruments, and his new Italian vibraphone from the ’50s showed up on the jazzy detour “Fontana Di Luna”. “It’s maybe, nearly cheesy?” says Rother of the album’s title track. “I don’t see it that way, but I can look at it from the outside and see that it could be considered sentimental and heart-warming – but for me it was about notes and harmonies and combinations, so it was not trying to be cheesy. As layered as his first two solo albums were, Rother’s third would introduce an even more pronounced sophistication – 1979’s Katzenmusik swapped the motorik pulse for more dynamic beats, as Rother experimented with repeating themes and complex chord modulations. It was a blissful, positive suite, recorded between March and July of that year, and innocently inspired by the guitarist’s affection for the feline species. The only time that Katzenmusik and its 12 tracks dipped from this romantic mood was on “KM 10”, a favourite of Rother’s and a return to the darker feel of the debut’s “Feuerland”. Its beginning was particularly striking, a freeform soundscape drizzled with drones from Rother’s favourite new toy, an eBow he had recently bought in London. Katzenmusik was Rother’s bravest and most complete solo work yet, but it was also the end of an era: next time, he would produce himself without Plank’s help, and record entirely at Forst. To this end, Rother spent months constructing a 24-track studio on the ground floor of the building, with its large windows looking out on the Weser. Jaki Liebezeit was present – even gloriously double-tracked on the opening, sun-dappled “Silberstreif” – but this would be his last album with Rother; from now on, the guitarist would delve deeper into electronics, and would work mostly alone. This collection, then, comprises Michael Rother’s entire solo work with Plank and Liebezeit, his most guitar-heavy records under his own name, and the music that most beautifully captures the idyllic surroundings of Forst. Some of the most pastoral electric records ever made, these albums remain timeless, beautiful and in constant motion, like the river Weser itself. The 21st century has, in many ways, been Michael Rother’s most free and experimental period as an artist, as the two extra LPs in this box demonstrate: here is a musician flitting between adventurous performances, soundtrack work and freewheeling collaborations as a guitarist and remixer. The hermetic, studio-bound composer of the late ’70s and early ’80s now expends most of his creative energy in a live setting, performing the music of Neu! and Harmonia alongside his own solo work, plenty of it from his first four solo albums. Captured on one LP is a brand new composition – perhaps more of an improvisation – performed live by Rother and his two able bandmates, guitarist Franz Bergmann and drummer Hans Lampe. It’s a fine example of his live sound, and something of a thread to his ’70s work. Also present here is a track by Hallogallo 2010, formed after the guitarist met Sonic Youth’s sound engineer Aaron Mullan at Camber Sands’ All Tomorrow’s Parties festival in 2008 – Mullan introduced Rother to Sonic Youth drummer Steve Shelley and the trio then jammed at Sonic Youth’s Echo Canyon West studio. The thrilling “Drone Schlager” was one result. Rother hasn’t released an album since 2004’s Remember (The Great Adventure), but his exemplary sense of space, texture and melody makes him perfectly suited to soundtrack work. Here, the guitarist has chosen and crafted a selection from two recent scores: his work for Houston is 12 minutes of weightless drift which would have fitted perfectly on Harmonia & Eno’s Tracks And Traces, while the four pieces from Die Räuber are more compact and playful, with electronics often to the foreground. These two scores were born from very different situations: Houston director Bastian Günther requested that Rother dig out old instruments for the soundtrack, and so he utilised his Framus bass from “Negativland” to conjure some layered, bowed bass drones, and the ‘dehgitarre’ from his early solo work for fluid melodies. “It was one of those magical moments when you just have to let the music flow without thinking,” Rother says. Die Räuber, meanwhile, was finished, but with no satisfactory score, so Rother was enlisted to develop sketches from his archive of ideas. Also collected here are Rother’s stunning remixes for Paul Weller and Boxed In, wherein this master musician keeps the original tracks’ vocals but adds his own backdrop of sustained fuzz-tone guitars and motorik beats. 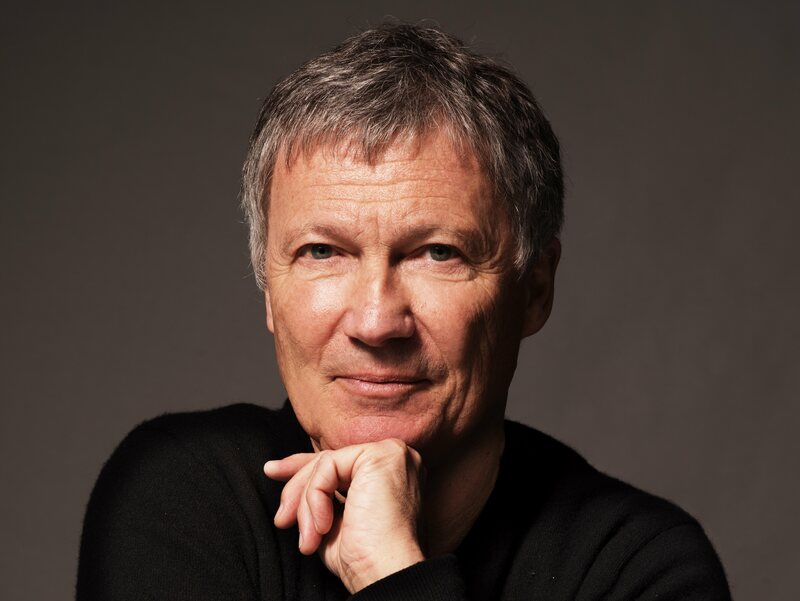 It’s a sound that’s quintessentially Michael Rother, and one that many have attempted to channel over the years, often forgetting the lightness and artfulness of his touch. Rother’s music has long seemed to flow steadily, sparklingly, almost effortlessly, from his inner being. Today, over 45 years after moving to Forst, he’s still able to tap straight into the bucolic, natural source that nourished his first solo albums. “Where does inspiration come from?” he says. “It’s a question to which I haven’t found a real answer yet. What I know is that Forst is an environment in which my heartbeat slows down and my breathing deepens every time I return home from a trip. I love to travel and to see the world, and I can enjoy crazy city buzz like in Tokyo for a certain time, but I couldn’t stay exposed to that kind of stress, of noise, traffic chaos and crowded places. I try to balance both worlds because it’s clear to me that I need a mixture of both.